In a hobby not lacking in them, one of cycling's more eccentric and interesting personalities has taken his last ride. Sheldon Brown, of Newtonville, Massachusetts, America's Fixed Gear Guru, suffered a major heart attack and died yesterday. He was celebrated far and wide for his encouragement of fixed gear cycling, owning no less than eleven of them, including an off-road tandem! His articles on fixed gear cycling, to be found on the Harris Cycling website, where he was the Webmaster and general tech guy, are exceptionally clear and concise. 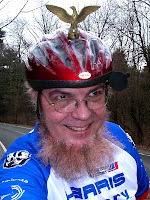 He was a goldmine of information not only about fixes but also about bike lore in general. His articles on the Golden Age of Cycling are invaluable to restorers and mechanics everywhere who are trying to figure out how to fit that cottered crank onto the French-threaded part. But in addition to cycling Mr. Brown had diverse interests, as you can see from him own homepage, including family history, photography and music. He enjoyed cycletouring in Quebec and was fluent in French. And he wrote an excellent explanation about the causes of the US Civil War! Having been diagnosed with MS, Mr. Brown had not ridden a bicycle since September 2006, and he had been keeping a journal of the effects of the illness. Although I never met him, the power of his personality--passionate, helpful, open-minded, humorous, self-reliant--came across strongly in his writing. He was proud of his family and appears to have passed his inquiring mind genetics to his children, both of whom are mathematicians. There was an interview with Mr. Brown on "the Bike Show, " where he talked about fixed gear touring in 2006 and another where he sang the praises of the English three speed a few months earlier. So let us wish Sheldon eternal smooth roads ahead on the Great Tour, and our sympathies to his family and friends. Such a legend, he will be missed.